Hilltop Villa with amazing sea and sunset views. Property 15: Hilltop Villa with amazing sea and sunset views. Property 32: San Antonio. Quality Private Villa+Pool. 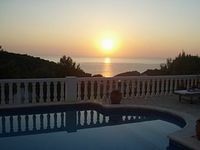 Superb Sea Views, TV, Wi-Fi, Air Cond..
Property 49: To rent Casa Dieter. Good, convenient villa. The hvilla matches the description. Viila is spacious, everything works. It is located in the good quiet district. near the beach and supermarkets. Everything was pleasant to us. We, 6 ladies, stayed at Casa Bella Vista for 5 nights and we enjoyed the lovely villa with the fantastic view. Roz welcomed us at the villa and explained everything very thorougly. Se was lovely and very friendly. The house was well equiped and even more beautiful than on the pictures. If you go down to the beach of Cala Salada, you can see the sun go down even better than at the house. Only one point of critisism is that the light of the pool did not work. Apparently this was caused by the storm before we arrived. Roz did everything to get it fixed. So that was again very positive. We would definitely like to visit Casa Bella Vista again. Thank you Matt and Roz!